LESS THAN THE COST OF CONVENTIONAL FOUNDATION CONSTRUCTION! Ready in just one day! Introducing the SMARTFOUNDATION™ a new and revolutionary foundation system developed through a collaboration between steel piles, patented insulated forms and reinforced concrete surface. 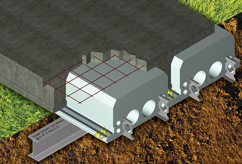 Together, this system provides an alternate solution to conventional foundations without digging. Up to 1,000 square feet of slab-on-grade foundation and concrete floor ready in just one day! 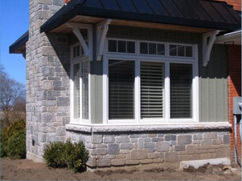 Thanks to SMARTFOUNDATION™ ... slab-on-grade foundation construction is possible in Canada! Concrete Slab Foundation Service in Acton, Concrete Slab Foundation Service in Aldershot, Concrete Slab Foundation Service in Ancaster, Concrete Slab Foundation Service in Aurora, Concrete Slab Foundation Service in Beamsville, Concrete Slab Foundation Service in Brampton, Concrete Slab Foundation Service in Brant, Concrete Slab Foundation Service in Brantford, Concrete Slab Foundation Service in Burlington, Concrete Slab Foundation Service in Caledonia, Concrete Slab Foundation Service in Cambridge, Concrete Slab Foundation Service in Campbellville, Concrete Slab Foundation Service in Cedar Springs, Concrete Slab Foundation Service in Dorchester, Concrete Slab Foundation Service in Dundas, Concrete Slab Foundation Service in Flamborough, Concrete Slab Foundation Service in Georgetown, Concrete Slab Foundation Service in Greensville, Concrete Slab Foundation Service in Grimsby, Concrete Slab Foundation Service in Guelph, Concrete Slab Foundation Service in Hagersville, Concrete Slab Foundation Service in Hamilton, Concrete Slab Foundation Service in Ingersoll, Concrete Slab Foundation Service in Kilbride, Concrete Slab Foundation Service in Kitchener, Concrete Slab Foundation Service in London, Concrete Slab Foundation Service in Markham, Concrete Slab Foundation Service in Milton, Concrete Slab Foundation Service in Mississauga, Concrete Slab Foundation Service in Mt. Hope, Concrete Slab Foundation Service in North York, Concrete Slab Foundation Service in Oakville, Concrete Slab Foundation Service in Paris, Concrete Slab Foundation Service in St. Catharines, Concrete Slab Foundation Service in Stoney Creek, Concrete Slab Foundation Service in Toronto, Concrete Slab Foundation Service in Waterdown, Concrete Slab Foundation Service in Waterloo, Concrete Slab Foundation Service in Winona, Concrete Slab Foundation Service in Oshawa, Concrete Slab Foundation Service in Etobicoke, Concrete Slab Foundation Service in Scarborough, Concrete Slab Foundation Service in Richmond Hill, Concrete Slab Foundation Service in Newmarket, Concrete Slab Foundation Service in Vaughan, Concrete Slab Foundation Service in Ajax, Concrete Slab Foundation Service in Pickering, Concrete Slab Foundation Service in North York, Concrete Slab Foundation Service in Concord, Concrete Slab Foundation Service in Rexdale, Concrete Slab Foundation Service in Gormley and Concrete Slab Foundation Service in Whitchurch-Stouffville.